All for fun, and fun for all. 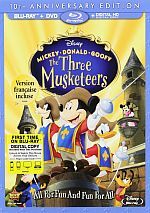 It's "All for fun, and fun for all" in The Three Musketeers, Disney's hilarious new animated musical starring Mickey, Donald, and Goofy in their first full-length movie together. Best buddies Mickey, Donald and Goofy are small-time janitors with great big dreams of becoming Musketeers. When Princess Minnie discovers that someone is out to get her, she demands that dastardly Pete, Captain of the Musketeers, provide her with bodyguards. As part of his wicked plan, Pete promotes Mickey and his pals into the legion of Musketeers and assigns the magnificent band of misfits to guard Minnie. Mickey, Donald and Goofy may not look like heroes, but they have a surprise for Pete. Powered by teamwork and friendship, they soon learn that there isn't anything they can't do. Usually Disney’s direct-to-video (DTV) offerings present cheap sequels to their theatrical works. In an unusual step, their 2004 adaptation of The Three Musketeers has no connection to a big-screen affair. 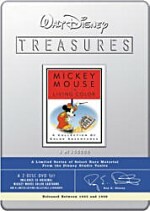 Instead, it acts as a vehicle for the studio’s three most famous characters: Mickey Mouse, Donald Duck, and Goofy. At the start, the project sets up the adaptation as a TV production. A turtle simply called the Troubadour (voiced by Rob Paulsen) inadvertently ends up as the narrator, and he leads us into the tale. The Troubador shows Mickey (Wayne Allwine), Donald (Tony Anselmo) and Goofy (Bill Farmer) as poor street urchins. The musketeers defend them so the trio dreams of becoming part of those ranks. We then see them as adults but they’re janitors. Still, they dream of becoming musketeers when they learn the meaning of “All for one and one for all”. The semi-incompetent trio screws up a cleaning assignment, and musketeer Captain Pete (Jim Cummings) yells at them and ridicules their dream. He says that Donald’s a coward, Goofy’s a doofus, and Mickey’s too small to become musketeers. In the meantime, we meet Princess Minnie (Russi Taylor), who pines to find her one true love, though he needs to be royalty. Some baddies called the Beagle Boys try to drop a safe on her but they narrowly miss. It turns out that Pete leads them, but he wanted to keep her safe, not drop a safe! Pete wants to kidnap the princess so he can become the king. After her scare, Minnie demands musketeer bodyguards so Pete recruits Mickey, Donald and Goofy since he figures they’ll not offer much defense. When she sees him, Minnie immediately falls for Mickey. During a carriage ride, Pete sends his gang to get her, and his thugs easily defeat the flawed musketeer wannabes. Feeling down, Mickey gives them a pep talk to inspire them to redeem themselves. The rest of the movie follows their attempts to thwart Pete’s plans and become real musketeers. This all leads toward a massive confrontation at the opera. No points for figuring out how it ends. As with most Disney flicks, Musketeers proves exceedingly predictable, though that’s usually beside the point. We don’t watch the studio’s films because we expect something surprising. We watch them to get well-crafted efforts that tell easily anticipated stories but do so in a charming and rich manner. Disney’s DTV flicks usually vary between average to abysmal. The occasional exceptions occur via entertaining efforts like The Lion King 1 1/2 and 101 Dalmatians II, but one hand remains sufficient to account for all the good ones. Musketeers lands close to the “good” category but can’t quite make it there. Some of that stems from its insanely telegraphed message. As I noted, virtually all Disney flicks give us easily anticipated progressions, but few do so as baldly as Musketeers. There’s no way that the film won’t eventually show each of our three heroes overcome their flaws. Donald will have to be brave, Goofy will have to do something smart, and Mickey… well, he can’t actually become larger, but he’ll have to act in a way that negates his diminutive stature. That’s all well and good, but we don’t need to be beaten over the head with those concepts. Still, Musketeers manages occasional instances of entertainment. It features an attitude that tries to be hip and modern, which I never thought really worked in efforts with classic Disney characters. Actually, that’s not totally true; the first Goofy movie wasn’t bad. Nonetheless, it sometimes feels like they’re trying too hard to be clever, and the gags don’t always work. Ultimately, I can’t say that I think much of The Three Musketeers, but I also can’t claim to dislike it. The movie moves briskly and presents some light humor. It never threatens to do anything terribly well, but it also fails to present many flaws. It’s acceptably entertainment and no more than that. The Three Musketeers appears in an aspect ratio of approximately 1.78:1 on this Blu-ray Disc. As one might expect from a modern-day Disney project, the picture looked solid. Sharpness seemed very positive, as at all times, the movie remained detailed and concise. No examples of softness or ill-defined images appeared in this tight and firm presentation. Jagged edges and moiré effects appeared absent, and I noticed no signs of edge enhancement. In regard to print flaws, I noticed none, as the movie looked clean and fresh from start to finish. Musketeers presented a bright and moderately cartoony palette. The colors consistently looked solid, as the hues came across as lively and tight. Black levels appeared deep and firm, with appropriately dark and rich material. Low-light images were concisely displayed and tight, with no excessive opacity. Overall, Musketeers gave us a fine presentation. The DTS-HD MA 5.1 soundfield maintained a bias toward the front speakers, and it displayed decent spread and imaging there. Music showed nice stereo separation, and a lot of environmental and other specific effects cropped up from the sides. The soundfield showed a good level of activity and made the front domain reasonably lively. Surround usage was relatively modest, though the movie enjoyed some active moments. For the most part, the rear speakers reinforced the front ones, but periodic instances of unique audio cropped up from the rear. For example, during a carriage ride, hoof beats appeared neatly in the surrounds, as did the trickling of water in a river sequence. These added decent dimensionality. Audio quality appeared positive. Speech came across as natural and concise, and I noticed no issues related to edginess or intelligibility. Music sounded fairly tight and brisk, with good dynamic range evident. Effects also seemed clean and accurate, and they could provide some nice low-end response when appropriate. Although the audio of Musketeers didn’t excel in any particular way, it still worked well for the material. How did this Blu-ray compare to the original DVD from 2004? Audio was a bit more dynamic and full, while the visuals were tighter, more vivid and precise. The DVD looked fine for its format but couldn’t compare with this excellent presentation. The Blu-ray duplicates most of the DVD’s extras, and these open with Deleted Scenes. We find four of them, and they run a total of four minutes, 56 seconds. These include an alternate introduction and more with the narrator. There’s a little more about romantic tension between Donald and Daisy, but none of these bits seem terribly interesting. One of these comes in story reel form, one other is finished, and the other two are rough animation. We can watch these with or without commentary from Disneytoons Studios Vice President Brian Snedeker. He gives us basic notes about the clips and why they got the boot. Disney’s Song Selection basically acts as an alternate form of chapter menu. It lets you jump to any of the film’s seven song performances, and it also allows you to show on-screen lyrics. Sing Along with the Movie provides on-screen lyrics for the tunes. Both of these feel pretty useless to me. Get the Scoop runs nine minutes, 39 seconds as it presents a featurette. Hosted by Monica Lee, it gives us movie clips and interviews with Snedeker, producer Margot Pipkin, director Donovan Cook, art director Bob Kline, story artist Kirk Hanson, editor Bret Marnell, music senior VP Matt Walker, and lyricist Chris Otsuki. They chat about the development of the project and the story, animating the sword fighting, the visual look of the characters, selecting a villain, and the flick’s musical style. Much of the time the participants pretend that Mickey, Donald and Goofy are real, which gets silly quickly. A few good tidbits emerge along the way, though, and it’s cool to see Hanson’s presentation of the storyboards. Ultimately, it’s a fluffy but moderately informative program. 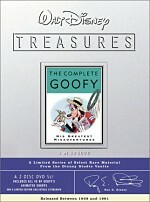 The Cast Commentary offers Mickey, Goofy, Donald and Pete as they chat about one scene. We see the segment in which we first meet the adult versions of those characters as janitors in this five-minute and eight-second snippet. For an in-character commentary, this one seems decent. It’s cute but not more than that. An odd extra, the one-minute, 47-second Get Up and Dance offers a kinda sorta music video. It mixes movie shots with images of three little kids who dance along to the song “All for One and One for All”. I don’t know what purpose it serves; it’s just strange and pointless. The disc opens with ads for Sleeping Beauty and Legend of the Neverbeast. Sneak Peeks presents the same clips. No trailer for Musketeers appears here. A second disc presents a DVD copy of Musketeers. It includes “Disney Song Selection” but none of the other extras. With Disney’s The Three Musketeers, we get a fairly ordinary program. There’s nothing bad about it per se, but nothing to make it particularly interesting either. I suppose it’s a telling comment that at one point I accidentally typed The Three Mediocres as the movie’s title. The Blu-ray delivers excellent visuals and pleasing audio but lacks substantial supplements. While I don’t find myself impressed by the movie, the Blu-ray packages it well.